I'm very thrilled when I received an email confirmation about working on a review regarding this product. 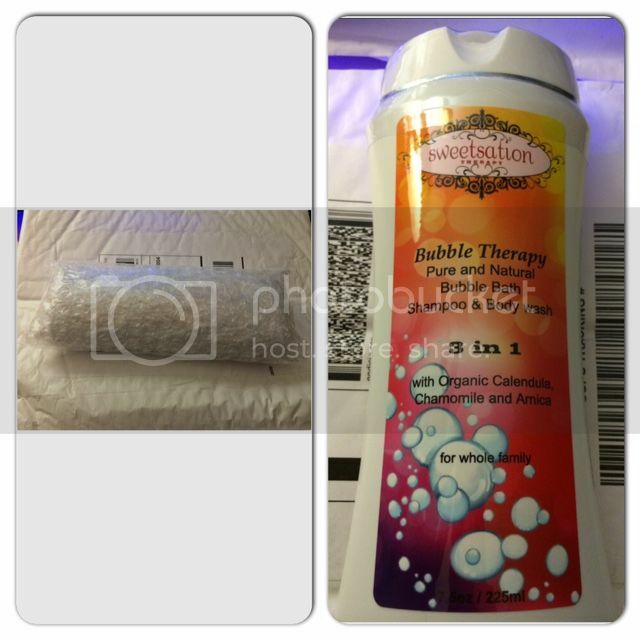 I expected my Bubble Therapy Pure and Natural Bubble bath in the mail on its good condition. The wrapping is impressive I don't see any leakage in the product shipping to me that I was able to use the bubble bath right away. Without looking how much it contains online, I didn't notice that the bubble bath is in medium size, until I finally got one in my hand. Its 7.5 Oz so just you know. The first time I opened the bottle I smelled a very nice and relaxing fragrance. I like the aroma, not strong and simply the Chamomile and Amica scent. Another thing I like about this bubble bath is that it is 3 in 1, you have shampoo, body wash and bubble bath which your kids would love all in one product. My son likes it too, he likes the smell and he enjoys it. Would definitely save you money. The ingredients of pure and natural it contains is also a bonus, something mothers look forward to every product they want for their children to use. For a small amount you need to use, it bubbles right away. Definitely going to save you a lot. Interested? You can purchase the product through HERE. Sounds like a great product. I love the scent of Chamomile. Like Lavender, it is very calming. I'm curious about the ingredient : amica. It's the first time I have come across this in a bubble bath. I love the scent of chamomile in any bath product! Sounds like an amazing product, not only do you come out of the shower smelling fresh and clean, it also saves you money, being a 3-in-1 product. Thanks for sharing. Would definitely have this in my home. Huwag lang iwanan yan ng misis ko sa CR or else, so sure I'll try it myself. My son recently experienced being in a bathtub when we checked in at a newly built hotel recently. He didn't want to get out of the bathtub. I'm sure he'll enjoy this 3-in-1 bubble bath, too.